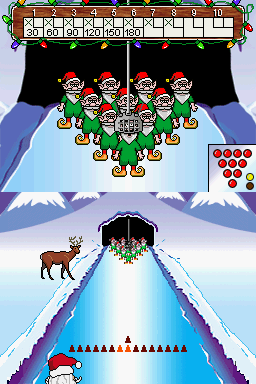 A TAS of Elf Bowling for the Nintendo DS. An encode is available here. I was surprised to see that a TAS of this hidden gem was not on this site, so I couldn't help but produce one. Goal wise I had originally planned to go for a perfect 300, but decided to go with an entertainment tradeoff at the end that prevents this goal from being reached, thus any%. DarkKobold: It is a funny but predictable end. While a great AF submission, not really publishable. Rejecting.